Today's TJNL giveaway is sponsored by Pat Huntoon! 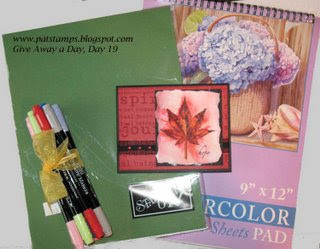 This prize package includes 10 Stampin' Up! markers, the card above, a package of Stampin' Up! paper, and a Pad of Watercolor Paper. To enter the today's giveaway, leave a comment on Pat's blog entry letting her know that you would like to enter. Enter by 11:59pm EST on Saturday, October 20, to be eligible to win! What a great prize! I'm going over to pat's to enter! !